Why this new Bible is making modern history! was the inspired canonical order intentionally ignored? Bible is unique in three ways. First, it is the only complete Bible ever published in one volume that accurately follows the original God-inspired manuscript order. Today, nearly all scholars and theologians recognize this manuscript order, but overlook its importance. 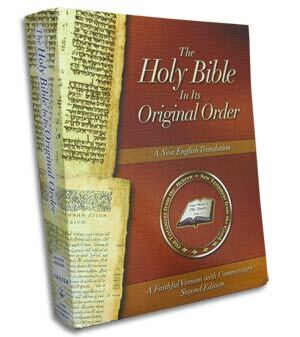 The Holy Bible In Its Original Order gives you, the reader, concrete, verifiable proof of the original, inspired manuscript order of the books of the Bible. Commentaries are included that trace precisely how the order of the books of the Bible was mysteriously altered by early church fathers in the fourth century, leading to the present 66-book format. Once the original order of the 49 Godbreathed biblical books is properly restored, God’s purposeful design of the Scriptures begins to unfold, substantiating its divine inspiration. Major portions of Scripture become “unscrambled” from an arrangement of neglect and disorder, unlocking vital keys to understanding. The Bible suddenly takes on a new sense of balance, symmetry and unity. accuracy— finally after 400 years, the mistakes of the King James Bible have been corrected! It combines current scholarship yet, it is free from the influence of religious tradition and presupposition. 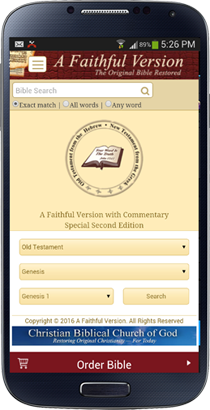 Old and New Testaments through its translation and its extensive commentaries. Over the centuries, numerous doctrinal errors have developed from inaccurate translations and rigid adherence to religious traditions of men. Setting aside such traditions, this new Bible restores more than just the correct canonical order—it restores the very truth of God. resurrected? What does it mean to be “born again”? What are “works of law”? What are the true teachings of the New Testament Church Jesus founded? Also, biblical and historical Chronologies show an accurate timeline from creation to the present; detailed Footnotes explain hard-to-understand Scriptures. 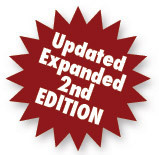 Includes center column references; word definitions and alternate renderings for key words; beautiful original artwork of the Temple in Jesus’ time; 280 pages of commentary; and various maps. “Understanding Paul’s Difficult Scriptures”—a vital reference tool for serious Bible students! handcrafted lambskin cover with gold stamped lettering; premium paper with gold gilded edges; wide margins for note-taking; triple bound for extra long life. Christ and the original apostles. 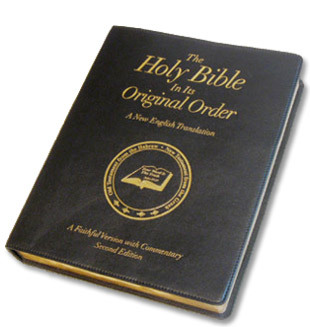 The Holy Bible In Its Original Order retails for $175. However, with this special online offer you can now own this exceptionally high-quality Bible by giving a donation to our sponsor, The Christian Biblical Church of God. All proceeds are to help the advancement of the spreading of the Word of God. Due to oversea shipping being very expensive (upward to $120 per a bible) this special offer is extended only to USA and Canada. The Lambskin and Calfskin bible is shipped in a beautifully designed box. Listen to the translator Fred Coulter narrate what is on the back of the box. Why This Unique Bible? 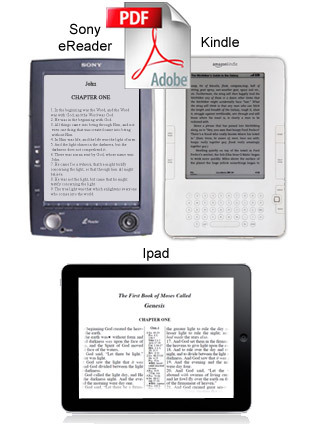 Available in four formats: PDF, Sony Reader, Kindle and Ipad.